"It's the way we train, relate & care for our animals that mold & shape their basic foundation." We are located in the foothills of the magnificent Alaska Range near the edge of timberline. Crazy Dog Kennel is a competitive racing kennel, owned and operated by wife and husband duo, Zoya DeNure and John Schandelmeier, dedicated to the training and rehabilitation of unwanted sled dogs. We operate sled dog rides as Delta Outdoor Adventures 3-27-2019 update: SPRING DOG RIDES! WE MAY BE THE ONLY PLACE ON THE ROAD SYSTEM WITH SNOW! IF YOU AREN’T RIDING WITH US, YOU’RE GOING NO WHERE! CALL 907-388-6039 OUR SNOW WILL LAST WELL INTO APRIL. that are nothing like the rides you will find near the cities. You will cross no roads, nor see any houses along the trail. Just mountains. Moose; more often than not. Spectacular alpine views; whether traveling from our kennel near Delta Junction or traveling to our cabins along the Denali Highway. Whether you drive dogs with us, fish with us, or travel by snowmobile you will be traveling with a guide with fifty years of hands-on experience in the Alaska outdoors. Make no mistake. This is the real deal. We are a family-run business that will treat you as one of the family and strive to tailor activities to your needs and desires. Take the drive to Delta Junction, it will be worth the trip! Half of the dogs in our kennel come from area animal shelters or are dogs rejected from other kennels. Many of these dogs would be considered to be unadoptable prior to their arrival at our facility. Here at Crazy Dog Kennel we let “dogs be dogs”; they are socialized with the goal of letting them become an integral part of the dog community. There are no failures at our kennel; all of the dogs are successfully rehabilitated and go on to race with us or are sent on to adoptive homes where most are used for recreational mushing. Sled dogs also make great house pets and many of our dogs become valued members of their adoptive households. Socialization and behavior adjustments are achieved through innovative, positive training techniques; there are few magic solutions; time and perseverance are the answer to most issues. 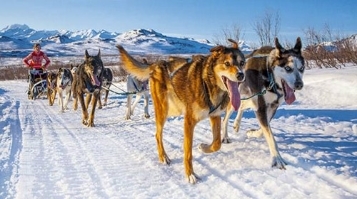 Teams from Crazy Dog Kennel and Canine Rescue have competed in and won races such as the Yukon Quest, Copper Basin 300, U.P. 200 and many others. We have well-behaved dogs of all ages and abilities available for immediate adoption. We also offer, dog sledding tours, rides and scheduled training clinics. Congratulations to Zoya on arriving in Nome in 57th place in the 2017 Iditarod! Read about Zoya in Pedigree Magazine! In an exclusive interview with Petigree Magazine, Zoya DeNure tells us how she went from modelling to becoming a professional sprint musher in Alaska. Read about Zoya in Friday Magazine! She used to strut the runways of Paris and Milan but Zoya DeNure now rescues and races Alaskan sled dogs.